When I dragged myself in the door yesterday I found that a new set of pictures came. Pictures from the military base in Alaska. Pictures of kids and dads and moms in the service. Pictures for me to put into quilts. Then today I kept rubbing and reading my tattoo - a way to get myself out of bed, a way to motivate myself to try to overcome post-infusion side effects. 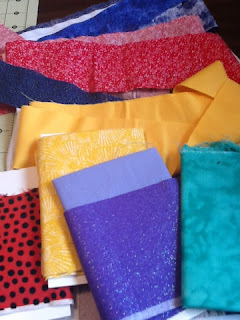 Put the two days together and I made it to the sewing room long enough to pick out some of the new fabrics to use in one of the new quilts.